Please note that I received a review copy of Galaxy Trucker from the publisher for review purposes. As you may know, I have a HUGE board game collection. It sits somewhere just over 200 games, but there are great titles that I don’t have for one reason or another. Galaxy Trucker is one of them. It’s always been a game that has interested me with its real-time, frantic, ship-building action that is mixed with random events that may-or-may-not end up destroying your hard work. There just aren’t a lot of games like it out there, so it is a very unique one on that front. Almost out of nowhere, Respawn Entertainment, the creators of Titanfall, released the latest contender in battle royale (well, outside of Tetris 99), Apex Legends. EA has a rocky relationship with fans, and the burnout in this respective genre has been pretty real. You may remember that I did not at all enjoy Fortnight and the last battle royale (BR) title I enjoyed even a little was Realm Royale. So it wasn’t surprising that I had my fair share of skepticism towards Apex. I first saw a commercial on YouTube for this game when it launched. At first I thought it was a spin-off game from the Borderlands series, but after my friend told me how great the game was, I was very quickly corrected. Having enjoyed Titanfall and its sequel immensely, I figured I should at least give this one a chance. Boy am I glad I did! Apex Legends is definitively the only BR game that I’ll play. My only grumble is that I can’t play the game on PC due to my internet situation. However, on the weekends when I have access to my PS4 (it’s in a different location, with better internet) it’s been my go-to game. This has sucked away time from Kingdom Hearts 3 and other titles I’ve been trying to finish, which is no small task. Balanced – Nobody feels too strong or too weak. I feel like I could jump in with any legend and do well. Team Based Play – You always have teammates who can make up for skills you lack (at least in theory). Quick – Matches never take longer than 30 minutes from my experience. Movement & Map – The map is big but you can get around very easily. Updates – Apex Legends receives pretty regular updates and it hasn’t been out long at all. Ping System – Apex has the single best off-mic communication system in any game I’ve ever played. It is extensive and very useful. You can ping just about anything for any reason, and the game generally knows what you want to convey. It’s awesome! FREE! – I really like that it is a free game because I’m poor. Expensive! – Even though this is a free game, if you want to purchase cosmetics or unlock the legends, you are going to invest either a lot of time or money. I have about 10 hours in the game and still haven’t unlocked another legend. If I went the real money route, it’s faster, but you are paying through the nose for stuff. No Punishment for Poor Sports – What I mean by this is you can’t report players who are rude, leave the game for no reason, etc… Apex doesn’t even have a leaver penalty. This really needs some kind of implementation because, I’ve had matches were another player obnoxiously pinged the map, screamed into the mic nearly the whole match, and have had players leave because they didn’t like you playing a certain legend. Menus – It’s obviously designed for PC first, so some of the menu navigation doesn’t feel good. For example, moving equipment in the inventory is annoying because you can’t drag and drop things. This isn’t something I think they could easily fix, but it makes the game harder to play, for me at least. Settings – I did not like the settings menu. There are a lot of options, but again, the navigation of the menu and getting things setup is not the best. For whatever reason, you can’t mute other players in-match either. You should be able to disable the mic at the very least. Still, the positives far outweigh the negatives currently. The community is largely very kind and I’ve been having a lot of fun. I even win fairly regularly, and I am not very skilled when it comes to shooters, especially with a controller. The game rewards tactical play, and that’s something I excel at, so I appreciate the fact that it encourages that type of play. I’m not going to go into any more depth on the game. This is just me saying it is awesome and that you should check it out. Even if you aren’t a big fan of BR games, or shooters in general, you may just find yourself enjoying Apex Legends. Given how the game has a solid roadmap for at least the next year, I think this one is here to stay. I really look forward to getting more games in and seeing how things change throughout the year as well! Are you playing Apex Legends? Tell me your favorite part of the game in the comments. If you would like to support my writing, please click the donation button below. Of course, thanks for stopping by and I hope to see you back here at Jon Spencer Reviews again soon! I love Freebird Games’ To the Moon, so whenever they release something new I check it out. Well, this is more like a re-release of a 2008 title, The Mirror Lied. The game is pretty abstract and only takes about 30 minutes to beat 100%. 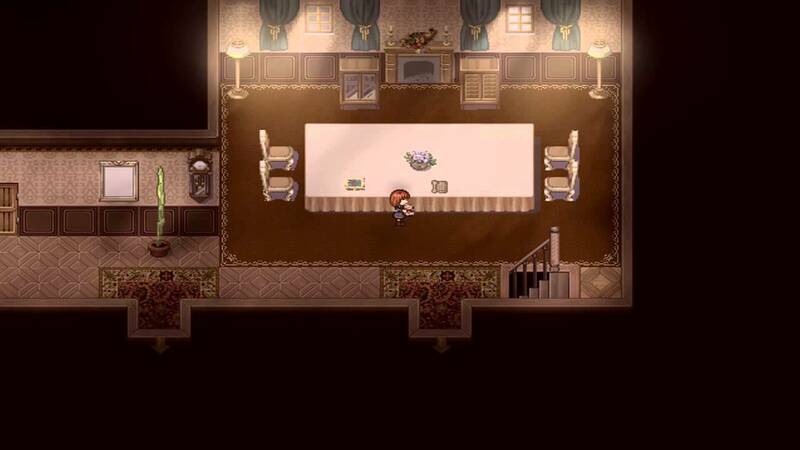 It was one of the games I tried out for my brief spooky game play session this Halloween. The big question here, is this any good? Really, I have no clue what to think of the story. It didn’t exactly make a ton of sense. Though I am not without some theories. There is a lot of referring to a birdie and a portion of the game where you look at, what appears to be, a virus under a microscope. My best guess is that some epidemic is, or was, about to take place and that is what the story is about. Past that, your best guess is as good as mine. It is very much up for interpretation. When it comes to the atmosphere it is kind of spooky but this isn’t a horror game at all. Stuff kind of just happens, the creepiest being a phone ringing with cryptic messages (if you answer). The Mirror Lied has one song for its soundtrack, which I liked ok, but it isn’t the greatest. As far as an initial impression goes, this is something to check out if you like more experimental games. With such a short playtime it isn’t really asking much of you either. If anything, it is something different. Finally, all the questions answered! Give the game a go, or not, it is free. What is your best guess for what happened in the story? Let me hear your voice in the comments. If you would like to help me out a bit please click the donation button below. As always, thanks for reading and hope to see you back here again soon! This will truly be a mini review, as I have very little to say about Confess My Love by LR Studio. This is a free to play game on Steam that is about, well, confessing your love to a girl. Toted as a horror title I thought this innocent looking title might be a good quick look for Halloween since that was around the corner. Sadly, there just isn’t much here and this isn’t really worth your time unless you plan to play the connected game Transparent Black. Here was my experience with Confess My Love. I spent two whole hours, with a guide after a bit, getting 100% on this game. At first it was fun to explore and see the various ways your crush, Liza will reject you, but it quickly became tedious. This was especially true if you wanted to get the true ending, which requires you to do a core loop that only has a 1/3 chance of even triggering in order to progress. To the credit of the developer, the game is streamlined enough that once you do hit that event trigger, you don’t have to repeat the whole loop any more, just part of it. However, a lot of the game is still just walking up to Liza at various times and choosing to confess right away or hesitate a bit. So is this spooky then? No. It doesn’t deserve the horror tag it received. There is an ending where Liza does accept your feelings but she becomes a ghost thing and murders you unless you run away. Eh. How about the story then? I at first thought this was going to be a story about how people can get in their own heads. Then with the introduction of the second character, Julie, I thought things would take a more Doki Doki Literature Club route where she would be the one with feelings for you and the, “correct” choice. Well all that is totally wrong! Instead, and spoilers (but really, you shouldn’t care), it turns out you were dead the whole time, Julie is the Devil, and Liza is just a construct of your own personal Hell in regards to your lingering regret upon death. There is a semi-cute scene where you find out that Liza liked you and she gets this cake you bought her but it was not at all worth it. One point of praise I can give to Confess My Love is that it has a lovely soundtrack of like 3 songs. Still, I enjoyed it thoroughly as I played those two hours so it wasn’t like the whole thing was awful. The game is just tedious with not much pay out. Conceptually interesting but lacking in execution. What free to play games would you recommend for the spook-tacular season? Have you played Confess My Love? Let me hear your thoughts in the comments below. If you would like to support me please hit my donation button below as I’d greatly appreciate it. As always, thank you so much for reading and have a wonderful day!